This is proving to be a busier week that I expected. On Sunday morning, I preached my last sermon as a canon of Christ Church Cathedral. This came at the end of a busy working weekend, when I finished teaching on the part-time MTh course. So, an invitation to dinner with friends who live on the banks of Lough Ramor on the borders of Meath and Cavan, was very welcome indeed on Sunday afternoon. Now I am in the middle of finalising details for the full-time module on Anglicanism, which is my final module to teach in the Church of Ireland Theological Institute, and at the same time there are papers to have signed and details to complete before Friday evening’s Service of Welcome and Introduction in Holy Trinity Church, Rathkeale, Co Limerick. Gregory Cameron is a former Deputy Secretary General of the Anglican Communion and is now Bishop of St Asaph in Wales. 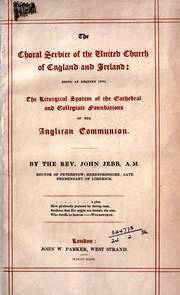 He identifies the first use of the term ‘Anglican Communion’ in 1843 in the title of a book by John Jebb, The Choral Service of the United Church of England and Ireland, being an Inquiry into the Liturgical System of the Cathedral and Collegiate Foundations of the Anglican Communion (London: James Parker, 1843). John Jebb was briefly a curate of Saint Mary’s, then a fashionable church in inner-city Dublin, from 1835. But most of his early church life was spent as the Prebendary of Donoughmore in Saint Mary’s Cathedral, Limerick, from 1832 to 1843. A year after arriving in Limerick he married Frances Bourke in 1833. She was a daughter of General Sir Richard Bourke (1777-1855), the Irish-born Governor of New South Wales (1831–1837), who lived at Thornfleld, in Co Limerick. On his return to Ireland, Bourke was High Sheriff of Co Limerick but declined to stand for Limerick in the 1841 election. He is buried in Castleconnell. Soon after John Jebb and Frances Bourke were married, his uncle, John Jebb, Bishop of Limerick, died near Wandsworth, Surrey, on 9 December 1833. Ten years later, John Jebb left Limerick in 1843, when he was appointed Rector of Peterstow in Herefordshire. He later became Prebendary of Preston Wynne in Hereford Cathedral (1858-1870) and a canon residentiary of Hereford Cathedral from 1870. Jebb was a leading authority on the Anglican choral tradition and a significant figure in the English choral revival. When Walter Hook, vicar of Leeds, proposed to reinstate choral services and a surpliced choir at Leeds Parish Church in 1841, he turned to his friend Jebb for advice. With his cathedral background in Saint Mary’s, Limerick, Jebb argued that in churches with a choir, the desired musical effect should not be marred by ‘the roar of the congregation.’ He persuaded Hook to adopt the cathedral form of service at Leeds rather than the alternative model demonstrated by the Revd Frederick Oakeley at the Margaret Chapel in London, where the role of the choir was to lead the congregation in response, hymn and psalm. Jebb’s policy was first made public in Three Lectures on the Cathedral Service (1841). A more scholarly and definitive treatment of the topic was published in 1843, the year he left Limerick for Hereford, in his The Choral Service of the United Church of England and Ireland (1843). This book was an inquiry in the low state of service and music provision in cathedrals and collegiate churches in the Church of Ireland and the Church of England, and it is here that for the first time that the term ‘Anglican Communion’ is used. Meanwhile, Jebb had funded the building costs of the new rectory at Peterstow. Saint Peter’s Church at Peterstow was restored in the 1860s under Jebb with Sir George Gilbert Scott as architect, and reopened in 1866, a year before that first Lambeth Conference. John Jebb died in Peterstow on 8 January 1886. His brother-in-law, Richard Bourke (1812-1904), was an assistant commissioner for the Poor Law in Ireland in 1847 and was Deputy-Lieutenant for Co Limerick. It is wonderful to read this brief history of Jebb, I have visited his statue often in St Mary's Cathedral and he is still held with high esteem in the county for what he tried to achieve here.